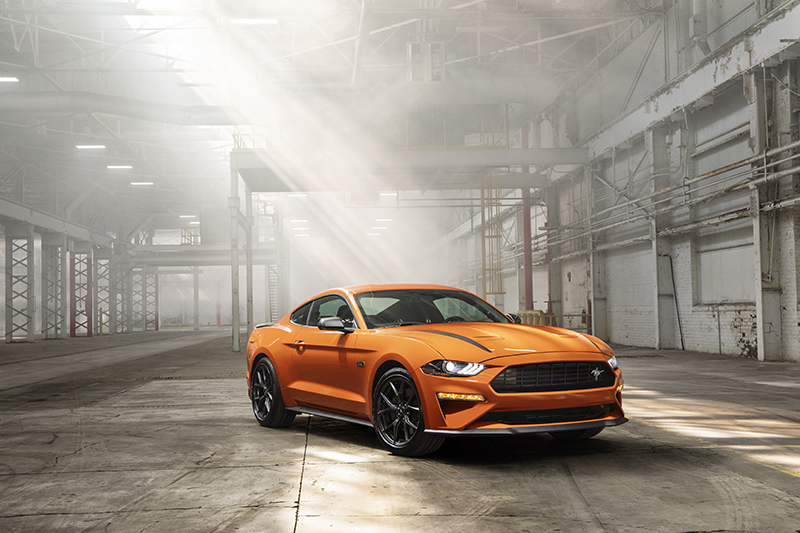 Ford Motor Co. in Dearborn has introduced the 2.3L High Performance Package for the 2020 Mustang. It will deliver 330 horsepower, 350 lb.-ft. of torque, and GT hardware. The 2.3L High Performance Package for the 2020 Mustang will be available this fall. // Photo courtesy of Ford Motor Co. Available on the entry-level Mustang EcoBoost fastback coupe or convertible models this fall, the package will have Mustang GT brakes, performance tires, and chassis, and aerodynamics hardware from the Mustang GT Performance Package. The package offers a 5-percent-larger 63-millimeter twin-scroll turbo compressor, a larger radiator, and an engine calibrated to run on Ford’s 10-speed SelectShift automatic and six-speed Getrag manual transmission. Designed to run 0-60 mph in the mid-four-second range on premium fuel, the package offers a top speed of 155 mph, which is a 10-mph gain over the 2019 EcoBoost Performance Package and 34 mph faster than the base EcoBoost Mustang. The package includes a quad-tip exhaust system.